Pat Milheron is a well-known name among the older denizens of the TI graphing calculator community. He was one of the programmers who wrote the original TI-83 operating system, and helped the community understand how to write TI-83 ASM programs. Rumor has it that he also provided examples explaining some of the more cryptic TI-83 Plus hooks, which have historically been among the least-well-documented items among the TI-83+'s OS features. Now, Pat has joined Cemetech as 6i8kjy to share the first real TI-84 Plus C Silver Edition game. Pat has taken an old TI-86 game of his called Pede, a port of the classic Centipede, and re-coded it to work on the TI-84+CSE. He took a few screenshots of the game in action, which he showed off in a post last night. His screenshots show Pede operating in a 128x256 area of the screen, understandable since the original TI-86 version had a resolution of 64x128. From these screenshots, several of our seasoned z80 programmers have speculated either that ASM programs will only get specific areas of the screen by default or (more likely) that the new calculator allows rectangular areas to be defined and drawn within as if they were a whole screen. 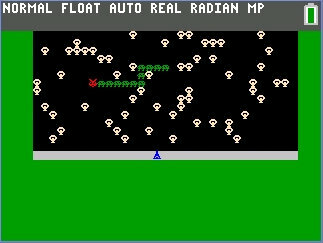 If this latter were the case, it would help assuage some of the doubts that our cadre of z80 assembly programmers have expressed about the speed and complexity of real-time games on the new platform. Please join me in welcoming Pat to Cemetech, and while I'm doubtful he would be able to answer too many technical questions about the TI-84 Plus C Silver Edition yet without violating his NDA, you're welcome to try. © Copyright 2000-2019 Cemetech & Christopher Mitchell :: Page Execution Time: 0.063412 seconds.